8:35 a.m., Dec. 14, 2011--Abhyudai Singh, assistant professor in the University of Delaware's Department of Electrical and Computer Engineering, has received the 2012 Best Thesis Award from the Center for Control, Dynamical Systems and Computation (CCDC). The honor is awarded annually to a University of California Santa Barbara graduate student from the previous three years based on originality, creativity and anticipated impact of the thesis. Singh, who joined the UD faculty in 2011, completed his doctoral work at UC Santa Barbara in 2008. His thesis developed novel computational and mathematical methods for studying and characterizing complex networks of genes and proteins inside cells. Singh’s current research interest lies in characterizing gene networks underlying disease systems, specifically pathogenic viruses such as HIV. A better functional understanding of these networks will benefit drug therapy by guiding their design to systematically tweak interactions and change protein levels. “Looking ahead, techniques developed in my thesis will be an important resource for the community for reverse engineering gene-protein networks, and linking failure in these networks with diseased states,” he says. Singh will accept the award, which includes a $1,000 cash prize and a plaque, during a future CCDC awards event. “This very prestigious award speaks highly of our newest faculty member, as it comes from a very large center that produces a large number of high-quality Ph.D.’s,” notes Kenneth E. Barner, professor and chair of the Department of Electrical and Computer Engineering. 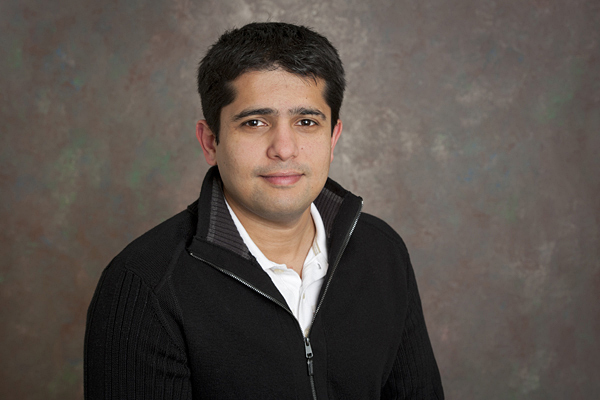 Singh is an assistant professor in the Department of Electrical and Computer Engineering and the Biomedical Engineering Program. He is also an affiliated faculty member of the Center for Bioinformatics and Computational Biology (CBCB). He earned his bachelor’s degree in mechanical engineering from the Indian Institute of Technology in Kanpur, India. Singh received master’s degrees in both mechanical and electrical and computer engineering from Michigan State University and went on to receive his master’s degree in ecology, evolution and marine biology from UC Santa Barbara. After earning his doctoral degree in electrical and computer engineering from UC Santa Barbara in 2008, he completed postdoctoral work in UC San Diego’s Department of Chemistry and Biochemistry.